Twelve long years after Philip Arnold and John Slack had departed Kentucky, brimful of optimism, life found them stepping off the Oakland ferry into a sea of genuine San Francisco mud. The rain had done its worst and no matter who you complained to in the city, the roads were a disgrace and seemed set to get worse. These had been lonesome years for our two prospectors, some damned hungry ones too. Folks shunned them as they walked along Market Street. It was obvious to any casual observer that they'd probably just come down off the hills and had had no success whatsoever. These two were pitiable, dirty specimens, mere relics of men, closer to beasts than human. Mud caked their hair and lacquered their thin worn leather coats. It was a lucky thing the fog had come in after the worst of the rain, for the very sight of these two men might have frightened horses or brought terror to young children and delicate noses. Theirs had been a brutal trip, and Slack hardly needed to go through the charade of wearing boots at all, for his toes poked out from both feet. No one would guess that under this mud lay proud manhood. Arnold, the shorter of the two, was brawny, somewhat stocky but deadly handsome, only the thinning of his hair revealed his age, but he was not a man to let that worry him. Slack had seen this man out-stare a rattlesnake and with those same bright, brown eyes he could test the nerves of the most confident poker player in a saloon or press the lady of his fancy to succumb to his natural charms. Slack had none of these attributes. At six feet he stood out among men, but even with the mud washed off, no one would ever think him distinguished or charming or even halfway handsome. Not even his sharp blue eyes assisted his demeanor. Nevertheless, youd be wrong to dismiss this man from his appearance, for a sharp brain hid behind the dirt and his plain manner of speaking. The truth of it was, here was a man who was honest and modest, content to leave the show to his partner. This particular day, however, he was a touch vexatious. As they made slow progress through the mire, Slack would pause every so often to stare behind them, as if he were expecting trouble. Hed been especially nervous on the nickel ferry, convinced that every soul knew their business that day. Arnold had done his best to calm him, pointing out that with the fog down on the bay, people were more than likely staring out to warn the Captain of the other boats, mindful of all the times in the past that the ferries had gone down with all hands. At Market and California streets the mud and chaos seemed to be at its very worst. Some Chinese laborers stood around a brazier warming their hands. They were watching others struggle with a slippery rope passed through a makeshift block and tackle as they lowered iron rails onto a stack behind them. They looked cold and miserable and probably wished they'd never answered the call of the Central Pacific railroad. Crocker's coolies, they were called, had been imported from China to build his railroad, but now some mean spirited folk were calling for them to be sent back to China. Yet who else would work so hard or so cheaply? The Chinese had been at Promatory when the golden spike had been driven in and recorded for history for all of mankind to witness. Yet from those photographs in the papers youd have been hard pressed to spot them. Now here they were digging Crocker and Hopkins Cable Car lines - testimony to their continued usefulness. Arnold and Slack kept a wary eye about them as they passed the diggings. Arnold cursed as he nearly slipped and fell. Slack held him steady. Arnold had one or two things to say about the cable car, too. It was one thing for the rich to choose to live up on Nob Hill, but for them to dig up San Francisco so as to provide themselves with transportation to get up there, well, even in Boston you couldn't have got away with that. Still, perhaps Arnold harboured a tinge of jealousy. In fact, Arnold kind of admired Charles Crocker. At least the man had been out there in the wilderness, not in some fancy office in the city. His enormous bulk had been sat at the railhead in his railcar every inch of the way, snow or bake, giving orders. There weren't many other rich folks you could say had actually earned their money and taken the government for such a ride. It had been with respect that Arnold and Slack had gone along to Crocker's offices way back in the summer of I870 and had told the big man about their idea of diamond prospecting. Crocker, like Arnold, had read with much fascination about the Kimberley diamonds and the fortunes being made in South Africa, so he had listened to Arnold, considered it, then turned them down flat. He'd built a railroad clear across the Sierra Mountains and up to the foothills of the Rockies. He'd seen gold, he'd seen silver, he'd even seen nickle, copper and quartz, but never once had he seen a diamond, and he for one didn't believe the American continent had a single one. There was no arguing with that. Arnold knew, right then, that if he was ever to get investors to help him join the ranks of those living on Nob Hill, he'd damn well have to find those diamonds himself. In this quest there had never been two more determined prospectors than Arnold or Slack, nor two more mocked for their obsession. Some scoffed, but it hadnt stopped the odd prospector, likewise dazzled by the riches being made in Kimberleys diamond hole, taking a closer look at quartz bearing rock and other semi-precious stones that would come their way from time to time. Yet, it's a fact between British Columbia and the San Joaquin valley, not a single diamond had yet turned up. Never daunted, Arnold and Slack combed the mountains and stalked the Indians. Somewhere, Arnold was convinced, the Indians had a secret place and he aimed to find it. Slack wiped the drizzle from his eyes and again cursed the fog which clung to his body like a wet blanket. He could hear people and horses around him, but only if one actually bumped into them could one actually see them. Fog or rain he could stand on their own, but together it made a person unnaturally damp and cold, likely as not to catch some fever that was always present in these foul-smelling cities. Slack was always loathe to leave the wilderness for the confines of a modern noisy city with its mountains of horse manure. City folks just didn't understand what it was to breathe fresh air, theyd be better off being born without a nose at all. Slack turned to Arnold and helped him up onto the boards of California street. All around them mud flowed like a constant stream of lava. There was an awful stench coming from the diggings in the middle of the road. The cable car trenches were filled with city sewage which having found its way in could find no way out. Altogether, what with the fog, drizzle, mud and the stench, one had to be a pretty determined kind of San Franciscan to walk abroad in this weather. Not a few citizens had already remarked in the pages of the Alta and the saloons, that afore they filled in those long trenches, the bodies of a few city fathers and railroad men could well find themselves lying at the bottom of them. Philip Arnold walked on, one sticky foot in front of the other, slipping and sliding on the irregular boards. 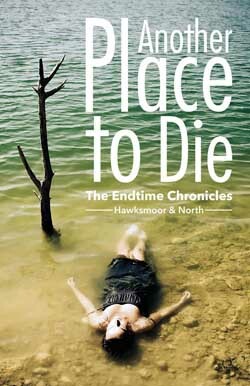 Slack began to cough, the years of dirt and dust in his lungs protesting at the damp. He began to wonder if all this was a mistake. A man only had his health, without that he was done for. The cruel contrast with the harsh heat across the bay in Oakland couldn't have been more emphatic. Their destination, however, was but one block away now. It was widely known that the newly constructed building had cost no less than a quarter of a million dollars to build and was the most magnificent example of its type. It was hard to make a judgement in this fog. Nevertheless Slack was of the opinion that you should judge a bank by the men behind the facade, not the other way around. He was a hard man to impress with piles of stone. Arnold came to a halt opposite the bank on California Street. An old battered Concord went by, its team of horses protesting at the weight of the mud on the wheels. Arnold wondered if coaches would be running at all once the cable car was completed. Perhaps it was time to buy Cable stock. Certainly he'd have to be considering some investments soon. It was a funny thing to be poor so long and then be on the very verge of a fortune, and have to consider ways to protect your wealth. Naturally all this was still in the future, there was much to be done yet, but the seeds had been sown. Suddenly anxious, he patted the coat pocket closest to his heart and was reassured to find a large hard lump still situated there. Theyd not been robbed...yet. Slack was still watching out for trouble. Every miner knew that the most dangerous time was crossing the street to the bank. There was always some scallywag lurking about ready for trouble. But on this miserable day, he'd have had trouble telling these two men apart from the mud, even if he could see through the fog. Arnold rested his hand on Slack's sleeve momentarily. "Bank's open now. Any doubts John Slack? 'Cause if you have, best say your piece now, there's no going back after this." Slack shook his head. He would not change his mind. Enough was enough. Everything they had had been invested in what rested in Arnold's pocket. Years of sweat and not a little blood has been spilled. Every last cent they could get out of the ground had amounted to just one small pile and to look at it, it was hard to say it had all been worth it. Twelve years is a long time to live in the bowels of Mother Earth, dining on nothing but promises and keeping a rifle handy in case of anyone who wanted to make his fortune the easy way. The fog thinned out for a moment, revealing the Bank of California in all its glory. Good blue stone lugged over from Angel Island had been used to clad the building, lending the imposing two storeys the solidity expected from the states principal banking institution. Well it had better be secure, Slack was thinking. Not that he seriously thought this bank could fold. He knew enough men up at the Comstock and Ophir mines who'd once been rich shareholders, richer than this bank itself, but each one in turn had gotten into debt somehow, and afore-long it was the bank itself who had become the largest shareholder. Bankers who didn't know one end of a pick from the other owned it all. The thought of it made Slack's blood boil. He reckoned that his time in Virginia City alone had earned him at least six windows and maybe a door at this bank. Naturally they couldn't stare at the bank forever. Still, it was a moment worth preserving. It had been a long time coming. To get as far as going into the Bank of California was an achievement, considering how they had been living these past months. Arnold had been contemplating on things more serious. Did they go into the bullion entrance - the logical place for prospectors - or the front entrance? The Bullion entrance was just across the way on Sansome, but it didn't seem right somehow. After all, they weren't carrying gold. He made the decision. The man they would have to see was the chief cashier himself, at the very least. A thought passed through his head that perhaps they should have paused at the bath house first, but then he quickly dismissed the notion, knowing how ridiculous they'd look with white faces peering out of these muddy clothes. "Come on," he muttered, nudging Slack off the sidewalk. Slack followed, ever vigilant, holding his rifle before him as if sure they'd be robbed in the bank, never mind five steps away from it. Now it might come as a surprise to hear that inside the bank things weren't as cool, calm and dusty as one might expect. This is because just a moment before Arnold and Slack set off across wide California Street toward the main entrance, a Mrs. Jennifer Bond, wife of William Bond, ship chandler and as a consequence a wealthy man, had entered the bank in wild confusion. She'd swept in with the fog still clinging to her pretty skirts and had been unable to speak, she was so much a twitter. It was all she could do to wobble her eyes and issue a plaintive hysterical squeak as she pointed behind her back into the fog, perhaps regretting she'd not taken flight the moment she'd glimpsed the robbers. The bank employees weren't entirely stupid, no sir. When any woman enters a bank all hysterical and pointing back towards the street, they would grow nervous wondering what misfortune was to come through the doors. The assistant cashier, Mr. Thomas Brown immediately stepped over to the stack of gold and silver coins beside the tellers nearest the door. In those days there were no grills and tellers weren't kept in cages. The double eagles were stacked twenty high, worth four hundred dollars a stack, conveniently placed so that tellers could scoop them up off the wide highly polished mahogany counters. Banking back then had the air of a gentlemens club, but Thomas Brown was a worrying soul. The fact that they had never been held up didn't mean they wouldn't be and with that woman throwing terror into every tellers heart, it strained no imagination to surmise the very worst. Mr. Thomas Brown, normally impassive and resolute in his stiff collar, paled. All eyes focused on the doors. Mere seconds later, the squelching footsteps of Philip Arnold and John Slack were heard slapping the boards. Thomas Brown hurriedly began scooping up double eagles and thrusting them out of sight. Several other tellers took his cue, and there was a great flurry as silver and gold disappeared off the counters. Their foresight was rewarded when in through the doors came Arnold and Slack in their muddy garb. Threat became reality when customers and bank tellers alike saw Slacks rifle held at the ready and the furtive look in Arnolds eyes. The atmosphere was so charged that if Slack had said as much as boo the tellers would have pelted him with the same gold coins to save their own skins. Instead, Slack swung his rifle over to his other hand and the tension rose perceptibly around the banking hall. Imagine, if you will, the look of astonishment on the faces of Arnold and Slack as they stood in the banking hall with the brass-plate doors noisily swinging behind them. It was pandemonium. Right before them women customers fainted, grown men shrank to the walls and tellers flung themselves behind the solid mahogany mass of their counters, with the occasional disembodied hand coming up for the last of the double eagles. Such dedication in the face of danger. Slack turned to Arnold and both wondered if they had walked into the midst a robbery. Arnold watched with bewilderment as people shrank from them in horror and regretted they hadn't stopped off at the bathhouse after all. Clearly the people of San Francisco had developed some very fine and sensitive noses since their last visit. “Anyone going to attend to us?” he called out, not hiding his irritation. Arnold stepped forward towards him and Slack likewise, his rifle cocked and ready. Something was going on in this bank, he didn't know what, but he was ready for trouble if it came. “We want to make a deposit.” Arnold informed Brown. They could see the color rise in the man's face. “A deposit?” He asked in an embarrassed whisper. Slack could hear people exhale all over the room. And if they’d had a mind to, they'd have seen a dozen or more red faces as timid cashiers bobbed up from behind their counters. There was much coughing and shuffling too. Thomas Brown was recovering now, especially as Slack was busy lowering his rifle and resting it against the counter. Brown caught the eye of Mrs. Bond, who turned away blushing. It was her panic that had caused this upset. She knew the town would gossip about it and it hurt her to think she'd be the focus of that gossip. Thomas Brown had indeed heard tales of wild times at the Comstock mine. He did not expect an apology from these men. This was the way they made sure they kept possession of what they had and it was their right to protect themselves. Still, there was no shame in being cautious. His heart still beat wildly beneath his vest. “If you'd come along to the end counter, sir, I'll attend to your business personally.” His voice was as controlled as a pastor at a Sunday service. Arnold well pleased with the answer and signalled to Slack to accompany him. Elsewhere in the banking hall, business returned to normal, and once again the coins were stacked on the counters, ready for business. People gave Arnold and Slack a wide berth, to be sure, but only on account of their embarrassment. They lived in interesting times. Two wild men from the hills come in and wanting to make a deposit. A wide berth was given, but not too wide...these two men had found something, and they were behaving mighty cautious about it. Perhaps a new discovery, or some new lode of gold or silver. Something they wanted to keep secret for a while until they laid claim. San Francisco had not yet sated its curiosity for new wonders and investment opportunities. Arnold had all of Mr. Brown's attention by now and with one final check around the huge, highly ornamental room for prying eyes, he brought out the large buckskin pouch that had warranted all Slack's security arrangements. Arnold lay the warm overstuffed pouch on the counter and kept his hand over it. He was not a man to trust easily, not even a cashier of Brown's publicly known honesty. Arnold looked at Slack and Slack looked at Arnold. It seemed a long way to come to not put the pouch in the bank. It was a dilemma to be sure. Mr. Brown waited patiently. There was not much money to be made out of placing valuables in their vault and the greater the value the greater the risk. The Bank of California could survive without these two miners’ business. Arnold smiled, not that the smile was so easy to see under all that mud. Mr. Brown quickly untied the knot securing the buckskin pouch. Propectors could be so secretive, it was tiresome. Gold did not spill out, nor silver, nor anything Mr Brown had ever seen before, or in such quantity. He was clearly astonished. Diamonds poured from the pouch, small, irregular translucent, along with other colored-stones. A less experienced man might have dismissed these stones as quartz or marble, but their shapes were irregular, and just in some, there was a hint of a sparkle. “Now that’s what we came to hear,” Slack commented. He had no liking for Grant, or his politics, but he had a lot of respect for his money. Arnold watched as a tin box was brought. The pouch was placed in it and then all of it was locked and a receipt issued. The diamonds were now in the safe keeping of the Bank of California, their secret sworn to by the assistant cashier. All was right with the world. Arnold was taken by surprise. He would have been surprised if his own mother had recognised him let alone George D. Roberts, mine owner and proprietor of the hardware store down by Bush Street. Roberts shook his head, adopting an amused expression. “Well I can see you've returned from the wilds again Arnold. Them Indians told you where they are hiding the diamonds yet?” He chuckled much amused by his remark. Slack noted the man's wig had slipped to one side under his silk hat. Now, here was a tricky problem. It was one thing telling everyone you were searching for diamonds, it's half of what prospecting is about, but when you've finally found some and just secretly deposited those same diamonds in the bank, the very last thing you needed was some blabbermouth telling the whole world about it. Arnold just shrugged. After all, Roberts would know in good time that he was laughing at them in vain. “Good day Mr. Roberts,” was all he uttered, as he and Slack walked by. Mr. Brown simply raised an eyebrow. But Mr. Roberts was no fool. He had noted which part of the banking room Mr. Brown was situated in, and the locked tin box clutched in his hands. There was something else too, a man like Philip Arnold didn't come into a bank without a purpose, and for him to want to see the assistant cashier, well, it indicated business of a serious kind. “You don't mean to tell me that Arnold has found his diamonds, do you Mr. Brown?” He tried on his most disarming smile. Mr. Brown looked down at the tin box momentarily and was surprised to discover that he was indeed holding it just like a new found babe. Mr. Roberts had made his point. He knew he wouldn't get past Mr. Brown and it was no use trying. He let Mr. Brown go about his business and he strolled over to the nearest teller unoccupied with any customer. He explained that he'd like a private word with the chief cashier, William Chapman Ralston. It wasn't so unusual for a customer to ask for William Ralston, and Mr. Ralston was a very accommodating man, visible to all in his inner glass office. He was there at this moment talking with the financier William Lent, a man famous for his knack of knowing not only how to get in on the ground floor of a thing, but knowing when to quit too. 'Getting out timely is as important as knowing when to jump in’, he was known to quote whenever asked financial advice and his opinion was much respected. The teller walked around the glass and signaled to Ralston. He briefly smiled when he saw Mr. Roberts nudge his silver topped cane in his direction. He indicated for him to give him a minute and Mr. Roberts took himself to a quiet corner to wait. What he had to say had best not be overheard. He took a deep breath in an effort to curb his natural enthusiasm. By god, diamonds! If Arnold had really found them then fortunes would be made. There had been countless expeditions to find these precious stones ever since Kimberly had inspired the big rush to Africa, but nothing had been found, no evidence of even a small stone. That was the main argument against Arnold succeeding. How had he found them when no one else had? Was it true the Indians thought they had magic properties and wouldn't like for the white man to get hold of them? Arnold had suggested as much more than a year ago when he'd tried to track the Hopis to a secret burial ground. He'd gone and gotten an arrow in his back for his trouble. Roberts was determined that he would discover Arnold's secret. The two prospectors could be bought off easily enough. He knew prospectors who'd spent ten years or more looking for gold, and just six months after finding it were absolutely flat broke again, if not dead from too much good food and loose women. 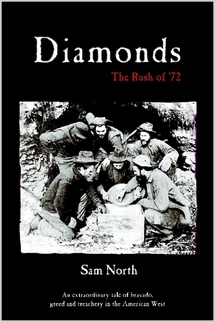 REVIEW: "Diamonds -- The Rush of '72"
What a story! An intriguing tale that had me wondering all the way through about which of these vivid characters, each with so much at stake, would outwit the others, to make their fortune during the Diamond Rush that got everyone in California and as far away as New York, London and South Africa all fired up again with more of the same fever that heated up the Gold Rush. I read it this summer as I was heading by car with my business partner up into the Northwest Territories of Canada to visit with an old flame of his, whose husband works as an engineer at the huge diamond mine in the middle of Great Bear Lake. There were a myriad of synchronicities between Sam North's book and our own adventure, so I can't be sure without prejudice if my rave review is a reflection of my incredulity with those co-incidences or simply an admiration for the writing. The research must have been monumental. So many details to verify. No doubt there's a lot of room to lie. There are many detailed portraits of characters we allow Sam to invent since thier only purpose is to color the story. But there's also so much that had to be factual, since it's all based in a true episode of that rugged history. I understood so much more about the past I've come from and the aspirations of the wave of immigration to the West Coast of North America, because "Diamonds" took me right inside the people and their dreams. The book moves smoothly and segues seamlessly from one character's point-of-view to another's. Just when you think you know what's going to happen next, there's another surprise. This book is a marvel.